red in Australia this charming cultivar belongs to the select group of wild flowers we commonly call ‘everlastings’. The delicate foliage is a grey-green with a mild chamomile perfume and forms a neat mound with a somewhat weeping appearance. 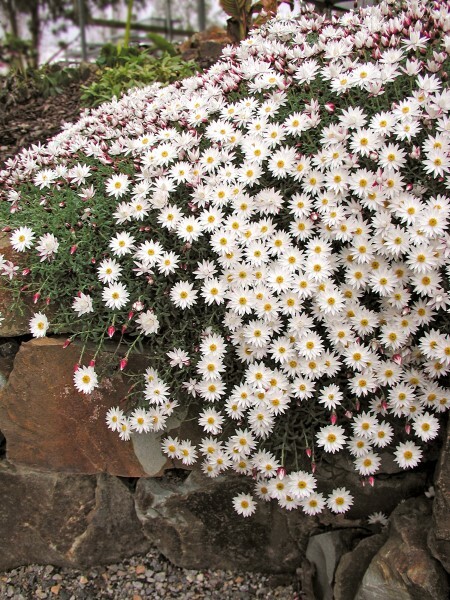 A profusion of flowers is produced in spring beginning with pointed crimson buds which open into pretty, star shaped, white paper daisies. When in full flower it is one of the most spectacular native plants available for borders and other high profile positions in the garden. The unique trailing habit of R. ‘Paper Cascade’ also makes it an excellent specimen in pots and hanging baskets. Plant in a moist but well drained soil. Tolerates full sun but is best suited to morning sun and afternoon shade. Occasional deep waterings during extended dry periods is recommended. Prune back by approximately by one third of overall size when new growth begins to appear after flowering. An application of slow release fertiliser at this time would also be advisable. For added performance a light trim and a further light application of fertiliser during autumn will be beneficial. 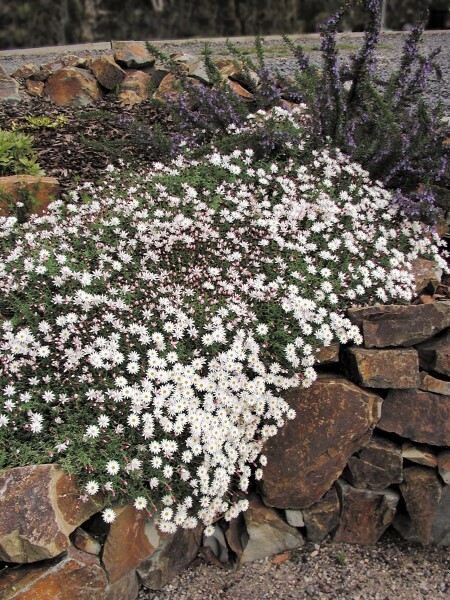 an be used in native or cottage style gardens, rockeries or containers. Ideal for cascading over retaining walls or from hanging baskets. R. ‘Paper Cascade’ will continue to flower for many weeks when brought indoors although it should be returned outdoors when the display is over. The flowers of ‘Paper Cascade’ are also worthy additions in dried floral arrangements especially in small posies and informal floral decorations. 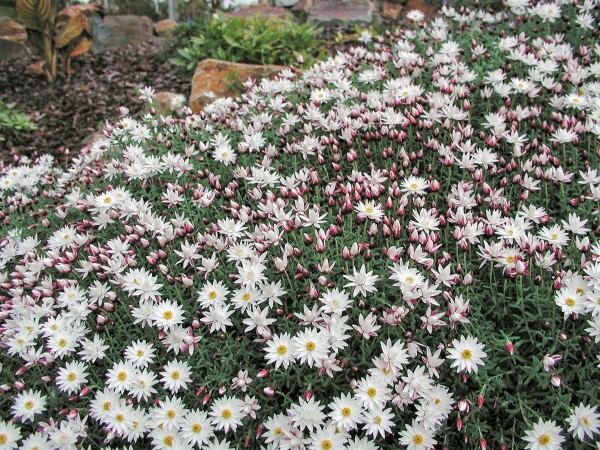 Like most everlasting daisies, once dried they retain their colour and shape indefinitely. The flowers can be dried easily by cutting the stem just as the flower is beginning to open and hanging loose bunches upside down in a dry place which is out of direct sunlight. In 3-4 weeks the flowers will be properly dried and can be arranged as you would fresh flowers.